Premium quality Milk Fed "Victoria Veal". Cuts available are scallopine, osso bucco, racks, cutlets and trimmed veal primals which are particularly good for making the old classic, vittello tonnato (see recipes). The calves are approximately 4-6 months of age with a carcass weight of around 100 kg and are from breeds which are predominantly beef cattle. The difference between milk fed veal and other veal is the size and age of the animal, much of the veal that is available seasonally and referred to as baby veal are actually culled male calves from dairy herds and are usually just a few days old. 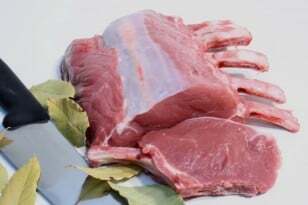 This meat is often used in processing and does not have the muscle structure and flavour suitable for table veal unlike the milk fed larger calves. Wursthaus are the sole Tasmanian Distributors of Victoria Veal which is branded not because of the state in which it is grown and processed but for the destination that it is mainly exported to, Canada. Seventy percent of the entire production is exported to Canadian and middle eastern markets and is eaten in Restaurants as far away as Dubai and Montreal and is also served in some of Hobart's finest eateries. We have been stocking this product for many years and believe it is some of the finest veal available in Australia. Slightly pink in colour, but still real milk fed veal? How can this be? Simple answer , unlike its European equivalent "White veal" these calves have been able to feed directly on their mothers milk and still be able to have a nibble of grass as they grow naturally. In Europe it is common practice to remove calves from their mother and lock them up or tether them together so they do not have access to any food that is likely to influence meat colour. (the biggest factor determining flesh colour is pasture type and quality) This practice actually causes the calves to be anemic; we don't believe this affects anything else to do with the eating qualities of the meat but the colour. So therefore why do it? All Victoria Veal as with all meat products sold by Wursthaus is HGP and chemical free. Ask our expert Butcher's and Chef's for advice on cooking and preparation.